Guitar Center has helped people make music for over 50 years. A gift card from the world's largest retailer of guitars, amplifiers, drums, keyboards, recording, live sound, DJ and lighting equipment can be used at more than 285 stores across the United States, online at guitarcenter.com or by calling 866-498-7882. With an unrivaled in-store Guitar Center® experience, an industry-leading online presence and passionate commitment to making gear easy to buy, Guitar Center is dedicated to helping musicians and non-musicians alike find their sound. Use of the card constitutes acceptance of the following terms: It cannot be replaced if lost, stolen or used without your permission. Use your GIFT CARD to make purchases at any Guitar Center location nationwide. Purchases will be deducted from your GIFT CARD until the balance reaches zero. Your current balance will be shown on your receipt. This GIFT CARD may not be redeemed for cash except as required by law. Value may be added to your valid GIFT CARD at any time. This card may not be used to make payments on your Guitar Center Gear Card. This card has no value until purchased and activated. Issued by Guitar Center Gift Card Company, LLC. For card balance information, you can inquire at any Guitar Center location, visit guitarcenter.com or call 800-407-4949. 1. Shop at www.guitarcenter.com online. PIN: If total amount of purchase exceeds the balance of the eGift card, click ‘Use Multiple Payment Methods’ to add an additional form of payment. 2. Bring it into any Guitar Center. Present eGift Card at the time of payment. REDEMPTION INSTRUCTIONS: You can use your eGift Card at any Guitar Center location and online at www.guitarcenter.com. Acceptance of this card constitutes acceptance of these terms and conditions, which may change at any time. 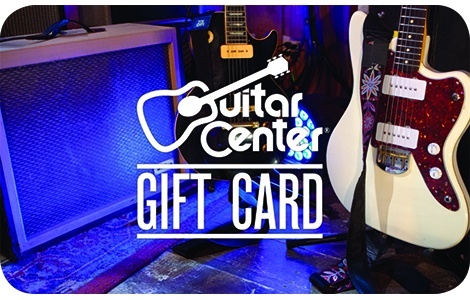 To hear your eGift Card balance, call 1-866-498-7882 or visit www.guitarcenter.com/gift-card. This eGift Card does not expire. PLEASE TREAT THIS EGIFT CARD LIKE CASH AND SAFEGUARD IT ACCORDINGLY.